There’s no place like home, there’s no place like home, there’s no place like home! Having just spent a week bored to tears on an Italian beach resort I’d have given anything for a pair of ruby slippers. 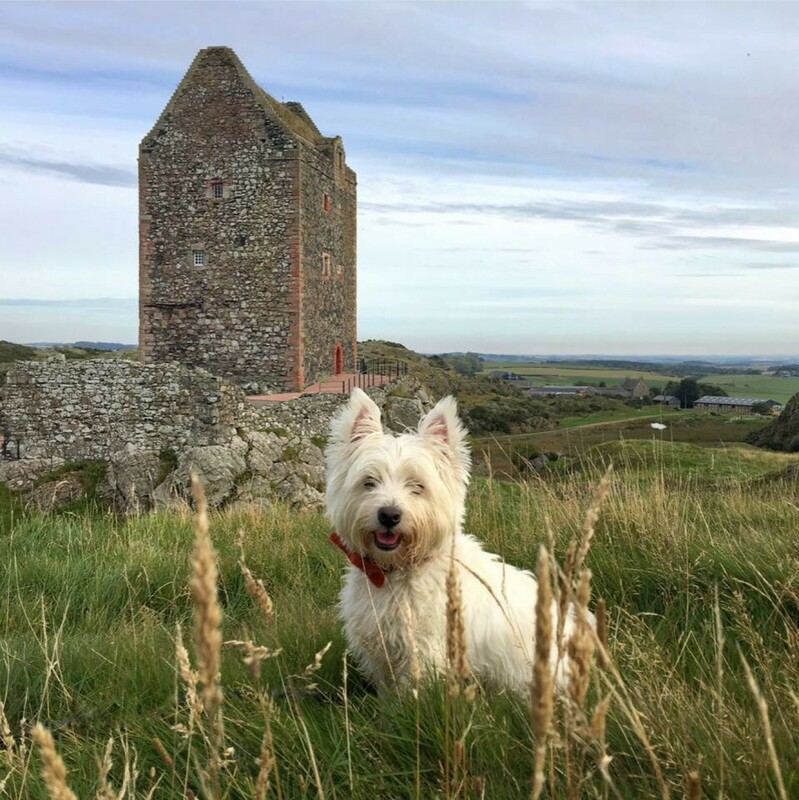 I missed the Wee White Dug like crazy and my beautiful country with its rugged landscape and rich tweedy colours. It seems loafing on a sun-lounger by a pool, or frolicking on a 10 mile stretch of featureless beach really isn’t my thing. The only thing that kept me going during that week were day trips to beautiful Venice and Treviso for some culture. That and copious amounts of Aperol Spritz. Meanwhile on Mull ….. not bored! It was a sight for sore eyes. Despite a forecast of rain for the entire weekend we were elated to be back where we were happiest – outside exploring Scotland’s less populated areas and wide open spaces. We had an enjoyable lunch at the Craignure Inn then decided to head to Lochbuie for a walk. Not 5 minutes into our drive and Mr G was ranting about a foreign car in front of us. Not only was it daring to drive ‘substantially’ below the speed limit but it was also committing the heinous crime of ignoring the allow overtaking signs and passing places. Mr G was apoplectic with rage. ‘Oh I know’ I agreed sounding uncannily like the long-suffering Cybil from Fawlty Towers. And on and on he ranted about not looking in mirrors, selfish driving, daring to ignore the CalMac island driving etiquette announcement on board the ferry. Ah it was good to be back. Lochbuie is a lovely part of the island. A wide sweeping bay, surrounded by gorgeous countryside. It has a wonderfully, quaint little place to enjoy a cake and coffee. The Old Post Office is well worth visiting. Lochbuie is also home to Moy Castle which features in the 1945 movie ‘I know where I’m going!’ The sites in the movies are still instantly recognisable today some 70 years later. I love that little has changed. For me that’s what makes Mull so special. The afternoon was warm and better still dry so we felt like we’d cheated the forecast – yippee. I’d very kindly been given a lovely new purple K-Way mac in a bag to put through its paces against the Scottish weather. No better blogger than an outdoor loving Scottish one to test the durability of rainwear! Said mac remained in its bag though as the Scottish weather had gone all Indian summer on us. Our island base for the weekend was the dug friendly Argyll Arms in Bunessan. Bunessan is one of my favourite villages on Mull but in all my years of visiting I’ve never stayed there. It was a perfect base. Our room was comfortable and clean with a lovely sea view. The staff and locals were really friendly and the food good. I’d expected standard pub fare but it was far better than that. Next morning we were up bright and early and headed to the small port at Fionnphort 6 miles away. Against my better judgement I’d booked us onto the 9:45am ‘early bird’ boat tour to the Isle of Staffa with Staffa Tours. I’ll tolerate boats but I’m no fan. I’ve also always found Staffa a bit foreboding and creepy looking. Staffa is most famous for Fingal’s Cave which is made of impressive hexagonal basalt columns much like those found at the Giant’s Causeway in Northern Ireland. Legend has it that Fingal a Scottish giant and Finn MacCool an Irish giant got into a bit of a spat which resulted in some rock hurling to and fro at each other across the sea. These rocks landed, piling up and created Fingal’s Cave and the Giant’s Causeway. Fingal was some man for a boulder. On the beach at Fionnphort there’s a huge split rock known as Fingal’s Rock which he’s said to have split with an arrow. Fingal crops up a lot during my travels and his shenanigans always make me smile. Anyway I digress, as we stood at the Fionnphort slipway waiting for our boat to arrive we watched the CalMac ferry cross from Iona. It looked choppy as in VERY choppy. They’ll probably cancel our trip I suggested? If the ferry’s being thrown around like that a wee boat will never set sail. And then we saw it, our tiny wee boat bobbing across the water towards us from Iona! Donning my new purple rain mac my stomach was lurching and I wasn’t even on the boat yet. Apparently a strong Atlantic swell was causing the choppy conditions making a landing on Staffa highly unlikely but there was no wind and overhead conditions were clear and expected to improve. We were offered a refund if we decided not to cross without the guarantee of a landing on the island. I said I wasn’t fussed about landing nor was I fussed about boats and fear rising I was considering not going anyway. Reassured it would be safe but choppy and knowing I had the get out clause of a refund if I chose not to cross I decided to live life and be brave. Staffa lies 6 miles west of Mull in the Atlantic Ocean. As we approached it was easy to see why it’s inspired so many over the years – Jules Verne, Sir Walter Scott, Mendelssohn to name but a few. The sea around the entrance to Fingal’s Cave was the most vivid turquoise I’ve ever seen. The roar of the sea was deafening. Huge waves crashed off the island and inside the cave. Our little boat aptly named Fingal was tossed around furiously but I wasn’t afraid. What I felt was euphoria – It felt great to be alive. A privilege to experience such a sight and something that will stay with me for life. My senses felt heightened. Even the wee dug who it turns out has a braw couple of pairs of sea legs seemed elated. My cheery, bright purple mac also performed admirably on its maiden voyage out to sea. If you ever find yourself in the area then I cannot recommend this tour or Staffa Tours more highly. They were excellent – friendly, professional and informative. I felt completely safe in their care. We ended our tour in Iona where we’d decided to have lunch and spend the rest of the day. Iona is one of my favourite places. It’s a tiny island paradise. It’s best known for the abbey and its St Columba association but there’s so much more to Iona than that. We had lunch at the dog friendly Argyll Hotel. A lunchtime favourite of our along with the nearby St Columba Hotel. Both hotels are owned and run by members of the local community. Both cook ingredients grown in their own organic community gardens. The standard of food served on Iona, like Mull is consistently high. Nothing beats eating lovely freshly grown, locally sourced produce. The Argyll holds the crown for our favourite lunch ever on our many travels around Scotland. One sunny day last summer after a hike to enjoy the spectacle that is Spouting Cave and St Columba’s Bay (the spot on the south of the island where St Columba is thought to have landed in 563) we stopped for lunch and had the most amazing open, egg and cress sandwiches made with delicious homemade bread plus a mug of soup each. We rounded lunch off with Arran Ice Cream. This year’s lunch was every bit as good. If you’re planning a visit to the islands and would like to know more about the wonderful eateries on Mull, Iona & Ulva then the Mull & Iona Food Trail is an excellent source of information. You’ll find many of our firm favourites there such as The Boathouse on Ulva, The Bellachroy, Dervaig and Cafe @ Calgary Arts by Calgary Bay. After lunch we wandered North through the ruins of the old nunnery, passing the medieval burial ground of Reilig Òdhrain where powerful warriors, Lords of the Isles and ancient kings such as Macbeth and Kenneth MacAlpin are thought to lie. The medieval grave slabs here are some of the best preserved and most intricate in Scotland. They’ve been lifted and moved indoors to preserve them which makes me feel a little sad but I appreciate the need to protect these priceless historical treasures. Intricately carved Celtic crosses outlined against a backdrop of clear blue sky are one of the things I picture when I think of Iona. For some inexplicable reason when I visit the sun always seems to make an appearance. One of my favourite historical treasures on the island is the Street of the Dead (Sraid nam Marbh) which leads from the abbey grounds to the cemetery. Down this street the kings, nobles and warriors who now lie silently in Reilig Òdhrain made their final journey on Earth. When I finally managed to drag myself away from the never-ending distraction of medieval treasures that I’ve seen dozens of times over we climbed Dun I, Iona’s highest point. It’s a mere 333 feet high but the views from the top on a clear day are phenomenal. I could have sat up there for hours soaking up the view. We chilled a while, then headed to the stunning white sandy beaches at the north of the island. A great day on planet Earth, spent in one of the most beautiful places on it. It really is true – there’s no place like home. Next Glamping in Perthshire with a wildlife choir! The ruins looked amazing! Would love to explore somewhere like that! Italian beach resort? Blah! Not even I would want to spend a week there (they’re so obsessed with their tans), and I live in this country. The photos in this post makes me want to flip through that issue of Scots Magazine again. My Dad came from Caithness – so I think I am Scottish, although born in Canada. We visited the Highlands in 2006, on a whirlwind two week, too short trip. I am not likely to get there again, but can vicariously visit, with my two Westies, through your work. I love Mull so much that I set a book there… Blue Belle by Sherrie Hansen. Staffa was wonderful. Next trip, we will see Iona. Great post. I know just what you mean about beach vacations. I love your adventures! I’ve only just arrived in Edinburgh for a year and hope to reference your blog as a guide to some awesome places. Hoping the train and bus will get me to some of them. Cheers! Such an interesting and informative post with some spectacular photos made even nicer with Sam posing in them! Great read! We are hoping to do the islands next year, only one problem…we get sea sick in a bath tub! 😬 Hoping we’ll find calm seas! Oh dear, apologies for my mistake – Casper is gorgeous. I’ve probably already mentioned before that we used to have a delightful Westie.. The best breed in the world !! I’m Nancy, nice to meet you Sam and Casper,of course. We’ve had Westies all our lives so love your wee white dug! Give him a hug from me! Hello Nancy, nice to meet you too. Will give boy a big hug from you. Westies are amazing little dogs. Thanks for joining us on our travels. A picture paints a thousand words,but your pictures are encircled beautifully with your words! I’m so glad i found your page. Utterly inspiring and a pure joy! I have my own wee white dug, and i will be following your footsteps very soon! Thank you. Your blog is amazing and incredible every time! Thank you! There is so much more of Scotland to see that I always want to hit the road (day or night!) when I see your pictures and read your stories. Sharing this so everyone can experience a bit of Scotland. A lady after my own heart: Mull & Iona are two of my favourite Scottish islands. So many happy memories on both.